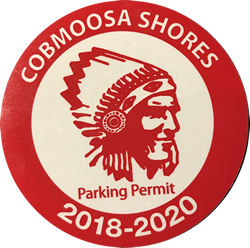 All owners in Cobmoosa Shores must have removable parking permit stickers when parking at the beach access areas. Vehicles without parking stickers are subject to towing. The parking permit stickers are to be displayed on the windshield of your vehicle or your guest's vehicle. If the parking permit sticker does not stick to the windshield, or if you are afraid that your guest will not return the parking permit sticker when s/he leaves, an acceptable alternative is to place it in a clear “pocket” and hang it from the rear-view mirror so that it is visible. ​Contact any board member if you need a parking sticker or use the Contact Form on this website.